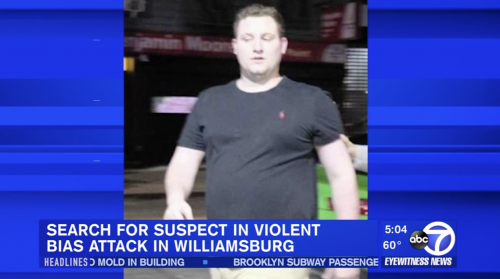 Police are on the lookout for a man who beat two men unconscious in Williamsburg after calling them a homophobic slur. The men, aged 29 and 34, had left the gay bar Metropolitan (599 Lorimer Street) late on Saturday night and were walking past Crest Hardware on Metropolitan Avenue after a night of drinks. Then the man in this photo approached them, shouted a slur, punched one in the face and pushed the other into a tree—and then beat both men unconscious. The men were taken to the hospital and are recovering, one with a fractured shoulder and the other with a broken finger. A bystander took a photo of the assailant, a white man with brown hair, and are encouraging residents to come forward with any information. If you know anything, please call the NYPD’s Crime Stoppers Hotline at 1-800-577-TIPS (8477) or for Spanish, 1-888-57-PISTA (74782).